Brands need to evolve constantly—with new products and marketing campaigns, and with the technology they use to inject the consumer’s voice into branding initiatives. Digsite makes it easy for teams to develop brand positioning and find fresh approaches to engage their target audience. 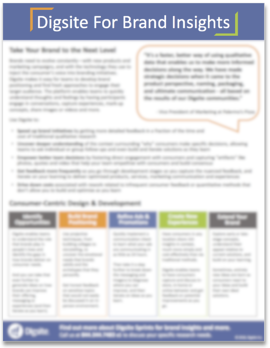 In this one-pager, you'll learn the ways you can use Digsite to take your brand to the next level and quickly capture consumer thoughts and feelings.